Jesse Rodriguez of McAllen skates while listening to music through his earphones at the new Escandon Skateboard Park in McAllen. McALLEN — The scenery around Escandon Park has been changing recently, with the neighborhood recreation area getting a new feature. 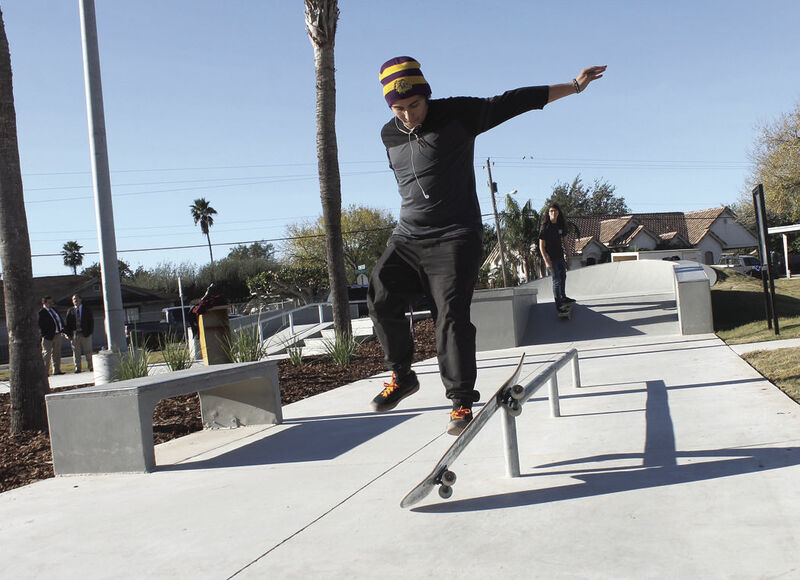 The city park located at 29th Street and Uvalde Avenue now features a skateboard park, a project that has been underway for the last couple of months. The skate park feature has long been a dream for the McAllen Parks and Recreation Department before finally becoming a reality Tuesday. Aida Ramirez, District 4 commissioner, said she was excited to have the new feature for the park in her district. Jesse Rodriguez of McAllen performs a board slide at the new Escandon Skateboard Park in McAllen. 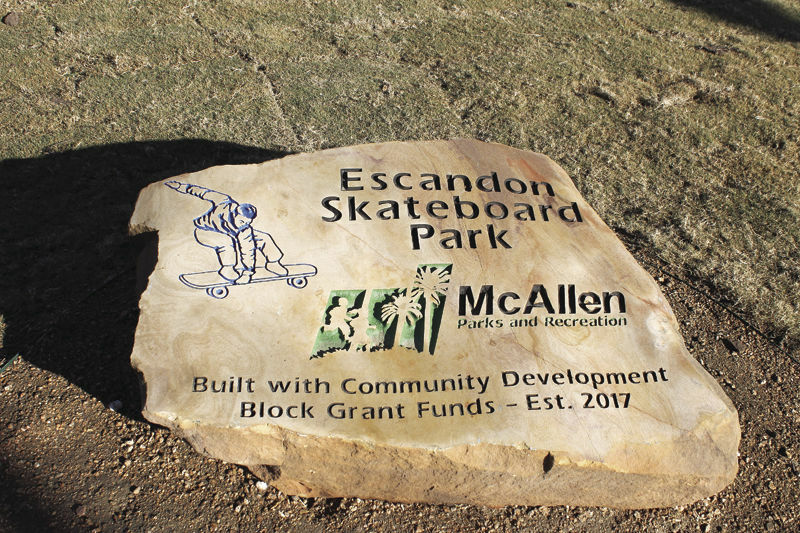 A stone marker shows the official name of the skateboard park at Escandon Park in McAllen. Escandon Park also features baseball fields, soccer fields and volleyball areas, among its amenities. “It’s really, really neat to see families come out here and enjoy family time,” Ramirez added. Roy Rodriguez, city manager, said the city is always looking for ways to maximize resources through employees cooperating together. “The palm trees, including the lighting, were part of Expressway I-2, U.S. 83 that we’ve had for decades,” Rodriguez said. “When we found out the construction were going to take them out; they were literally going to cut them down,” Rodriguez said. Rodriguez began calling other departments on how to repurpose the foliage and palm trees and after several phone calls, they’re now surrounding the skateboard park. “This park was not only designed and constructed entirely by the city of McAllen staff, but with partnerships by MISD (McAllen school district), who donated the grass, and we repurposed everything around it,” Rodriguez added. Mike Hernandez, director of parks and recreation, said they repurpose everything that they can get their hands on. The skateboard park was made possible by $110,756 in Community Development Block Grant funds through the federal government. The city commission allocated additional funding of $14,244.